The Moon enters Taurus at 12:22 pm EDT today, and even though there are now four planets in supreme multi-tasker Gemini, this placement should help slow the pace to a manageable level and give us all a breather today. Add in a Moon/Ceres aspect and it’s a day to take care of ourselves and pay attention to our physical health and examine our daily habits. The Moon/Neptune sextile at 6:42 pm EDT is excellent for creative yet practical endeavors and is a reminder to take a break and just appreciate what’s around you. It’d be a great time for a trip to the park or a walk in the woods. The Keyword for the Sabian Symbol is “Fun ”. The Keyword for the Kozminsky Symbol is “ Glory ”. “Fun & Glory”–quite a combination! 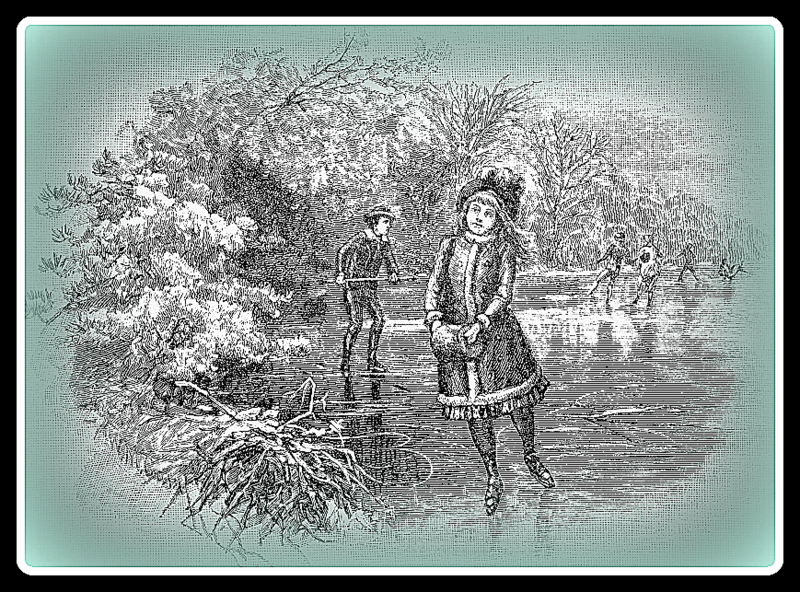 The children skating on ice are enjoying a simple pleasure, out in nature (reflective of today’s Taurus Moon). There is, however, an inherent warning to be careful and skate only where there is a solid foundation of thick ice (Taurus), and to be ready to adapt to changing conditions (all the planets in Gemini). It requires skill and adroitness (Gemini again) and emphasizes the spirit of adventure. The woman giving bread to the starving is a perfect representation of the Moon/Ceres aspect as well as the Moon in Taurus sextile Neptune in Pisces (giving sustenance to the masses, trying to better the world condition, caring about others). Being charitable, thinking of others and giving practical, useful assistance to as many as possible is also the best manifestation of the Moon in Taurus when it joins with with Neptune in Pisces. Jerzy Kosinski, Harriet Beecher Stowe, John Bartlett (“Familiar Quotations”), Pierre Salinger, Donald Trump, Boy George, Che Guevara, Steffi Graf, Yasmine Bleeth, Gene Barry, Andrey Markov (mathematician), Ion Antonescu (Romanian dictator), Alois Alzheimer, May Allison, Kawabata Yasunari (1968 Nobel, Literature), Margaret Bourke-White, Rene Char, Pauline Moore, Al “Lash”La Rue, Dorothy McGuire, E. Culyer Hammond (scientist, linked smoking to lung cancer), Sam Wanamaker, Cy Coleman (songwriter), Renaldo “Obie” Benson (The Four Tops), Laurie Colwin, Rod Argent (Zombies/Argent), Barry Melton (Country Joe & the Fish), Alan White (Yes), Jim Lea (Slade), Leon Wieseltier, David Thomas (Pere Ubu), Will Patton, Sam Irvin, Chris DeGarmo (Queensryche), Diablo Cody, Janet Lennon (Lennon Sisters), Papa Wemba, Jorg Immendorff, Lang Lang (pianist), Alexander Sokurov, Rowan Williams (Archbishop of Canterbury), King Diamond. “Skating on Thin Ice.” Use your skills wisely (Gemini planets, see above; the planet associated with the Magician is Mercury, ruler of Gemini.) Maybe we’ve painted ourselves into a corner that even our fanciest footwork can’t get us out of. This combo can indicate communication collapses, computer or internet crashes, nervous breakdowns, or any sudden accident or “crash” that we can’t avert. There’s a little of the “mad scientist” in this combination, as tinkering around with larger forces can lead to unintended systemic derangement (think: global warming, those nuclear reactors we thought we could “control”).